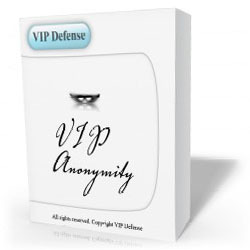 VIP Defense - VIP Anonymity - Hide your IP and keep in secret sites you visit. - Instant Download. Meet VIP Anonymity - the best anonymizer in the entire Internet! Try it now and become anonymous forever! Any web site in the world can track your movements through its pages and monitor your surfing habits using your IP address, a unique ID assigned to each computer in the Internet. Using only your IP address and the information about your operating system a Web site can automatically exploit security holes in your system with the help of free hacking programs available in the Internet. Some of such programs may just hang your machine making you reboot it. More powerful ones can get access to the content of your hard drive or RAM. There are a lot of programs available to break your privacy, steal your identity and money online. You must protect anonymity or your life can ruin one day! VIP Anonymity prevents everyone from knowing your IP address. Actually, it hides your IP address from others and it changes IP to somebody's else, who may be situated on the other side of the Earth. VIP Anonymity redirects your traffic through a chain of anonymous proxy servers all over the world. Such servers do not transfer the information about your IP address and thus effectively hide the information about you and your surfing interests. The idea is that so many other people are using the same proxy that your particular traffic is impossible to locate, being lost in a crowd. Even if somebody manages to get an IP address, it won't be the address of your computer but the IP address of the anonymous proxy you used. The anonymous proxies themselves are called so because they don't collect any information of their users. They never write down your real IP address, they never maintain logs. More interesting thing is that they appear and vanish almost every day. VIP Anonymity builds a list of currently available anonymous proxy servers at its startup and tunnels your traffic through them. Your request may go to China, then to Australia, then to Philippines, to Japan, To Russia, to Italy, to Brasil and only then go to the site you requested. The response of the site travels the same way. The request and response change their target and destination IP addresses each time they travel from one anonymous proxy server to another. No one can recover the real path of them, so your real IP address is surely hidden in space and time. How can I anonymize surfing with VIP Anonymity? Make your browsing anonymous is as easy as 1-2-3. Download VIP Anonymity, install it and run. Click on Start button in its main window. That's all! From this time you will surf completely anonymously. Open any browser you like (VIP Anonymity supports Internet Explorer, Netscape Navigator, Firefox and Opera of any versions) and navigate where you want. All your traffic is hidden, your real IP is invisible, your miracle IP is changed to someone's else on the other side of the Earth. Enjoy! So you really recommend downloading this Anonymizer? For sure! You should start using if to protect your anonymity simply because this is the best anonymizer available at the moment. We out three years in its development and we can give you our iron clad guarantee that no one, never will know your real IP address or track your Internet browsing from the moment you started our anonymizer. Without VIP Anonymity, you're at the risk of overt attacks or snooping. At best, that means your Internet access could be disrupted. At worst, someone could steal your banking information and personal data, you may be fired, arrested or divorced. With our VIP-class Anonymizer you are safe and free to do everything you want in the Internet without anybody knowing ot it. This is the real Internet Freedom. Look through key features of VIP Anonymity to realize that this is the program you can rely on. I\'ve installed the vip anonymity software and can not be activated in windo 7 (64) please advice!